Pianist and composer Leandro Cabral is proud to announce the release of “Alfa”, his sophomore album as a leader. On “Alfa”, Cabral presents a unique palette of sound that is both grand and introspective. The album will be released in Brazil on October 21 and internationally on November 21. 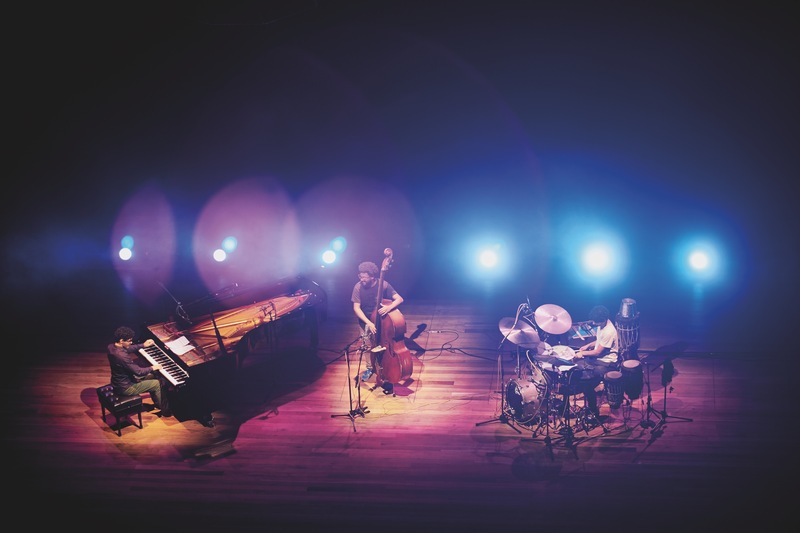 The Leandro Cabral Trio is comprised of three Brazilian musicians, each notable within their generation for their unique contributions to jazz and contemporary Brazilian music. Cabral, who jumpstarted his career with the incomparable Ed Motta, is joined by bassist Sidiel Vieira and drummer Vitor Cabral. On standout track “A Dança”, vocalist Vanessa Moreno shares her beautiful stylings alongside saxophonist Cássio Ferreira. “Alfa” also features rich arrangements of Brazilian classics such as “Rapaz de Bem” by Johnny Alf and two songs from the iconic songbook of Antonio Carlos Jobim: “Inútil Paisagem” and “Outra Vez”. For over a decade, pianist and composer Leandro Cabral has been setting the Brazilian jazz scene on fire with his bold compositions and skillful playing. Born in Santo André – SP, Cabral grew up listening to gospel music at his church. Leandro started his studies on classic piano at age seven, and at fourteen, he enrolled at the prestigious Fundação das Artes de São Caetano do Sul. It was there he was first introduced to the worlds of bossa nova, jazz, and improvisation; especially after partaking in harmony classes with Nelson Ayres at the Festival Internacional de São Caetano do Sul. During his teenage years, in parallel with his formal studies, he frequently played gospel music in a new-pentecostal church. It was there that he was given his first opportunities to record. At age sixteen, he began to flourish in São Paulo’s nightlife scene. At age seventeen, he started his bachelor degree on piano by the Faculdade de Artes Alcântara Machado – FAAM/FMU, and graduated in 2004. Some of his professors marked him deeply: Ricardo Rizek, Sidney Molina, Orlando Mancini, Marisa Lacorte and Abel Rocha. At age twenty-two he was invited by singer and musician Ed Motta to be part of his band. With Motta, he recorded the album “Piquenique”, of the instrumental project “Aystelum/Dwitza” for SESC TV and thus went on tours of Argentina and Brazil with him. In addition, Cabral has performed and/or recorded with Maria Rita, Seu Jorge, Filó Machado, Akua Naru, Honey Larochelle (Macy Gray), Rashid, Wilson Simoninha, Paula Lima, Roberta Sá, Giana Viscardi and Cynthia Utterbach, among others. He often performs with other musicians: Ed Neumeister (USA), Adonis Rose (USA), Lupa Santiago, Sérgio Galvão, Edu Ribeiro, Vincent Gardner (USA), Hector Costita (ARG), David Richards (USA), Nailor Proveta, Jessé Sadoc, Daniel D'alcântara, Casey Scheurell (USA), Cuca Teixeira, François Lima, Letieres Leite, Bocato, Idriss Boudrioua (FRA), Vitor Alcântara, Jaques Morelenbaum, Vinícius Dorin, Walmir Gil, Luis De La Hoz (CUB), Paulinho Guitarra, Wilson Teixeira, Arismar do Espírito Santo, Thiago do Espírito Santo e Márcio Montarroyos. In 2012 he joined the faculty of the famous Conservatório Souza Lima. He participates of masterclasses with several masters, being them, among others: Marcus Miller, Joshua Redman, Jovino Santos (Hermeto Pascoal), César Camargo Mariano, and Letieres Leite (Orkestra Rumpilezz). Other recent projects include “Leandro Cabral Grupo celebra Moacir Santos e Letieres Leite” which debuted in São Paulo in 2015 and was praised by Letieres himself, as well as the newest album “Ubuntu” from guitarist Lupa Santiago. In February 2015, he recorded his first album titled “Sobre Tradição”, which went on to receive critical acclaim. This recording was also presented in video and gave origin to the web-series “Arsis Piano Sessions apresenta Leandro Cabral Trio | Standards”, which gained a prominent following and continues gain popularity. He collaborates with several projects: Ed Motta, Lourenço Rebetez, Daniel de Paula & Irmandade, Jorginho Neto Collective, Lupa Santiago Quartet, Deep Funk Session and Irmãos & Brothers – on the latter three projects, he is also composer and arranger. Frequently, he has been on tour with his group, trio and solo piano. ← Matt Ulery reviewed by Grego Applegate Edwards!